News of the government’s plans to invest in Gatwick airport railway station (December 2013), has prompted me to report on a visit I did behind the scenes back in the summer. Only five years ago, I used to sigh when I learned that I would be flying from Gatwick, even though it was only 20 minutes from my home. Enormous improvements have taken place since then, with new owners celebrating four years in December. With Heathrow’s Terminal 2 due to open in June 2014, London’s other main airport is keen to demonstrate it is as good as, if not better, than its main rival. 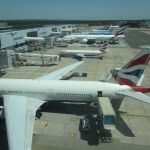 Gatwick has the world’s busiest single runway, with a plane landing or taking off every seven seconds. Gatwick covers more European destinations than any other airport and 48 scheduled airlines fly to over 100 countries. To cope with all this, a 1.3 billion investment over three years has been planned. In particular, new snow equipment meant that last winter (2012), while Heathrow had over 1,000 cancellations due to bad weather, Gatwick had none. A heavy investment in a better experience for its 34 million passengers can already be seen in shortened waiting time at security in South Terminal with automatic gates, better shops (a new 6,000 ft Harrods opened in summer 2013) and improved food and beverage provision. Bag drop queues are a big issue for airports and Gatwick is working on self bag drops with easyJet and Flybe. Online check-in is becoming more usual; BA has an 80% online rate and easyJet is working towards 100%. All passports will have microchips by 2017 so customers will use the automatic gates. These advances in technology all help to make that trip to the airport less fraught. Shopping revenue is important for Gatwick: 93% of travellers go in a shop and 86% make a purchase. The average spend on food and drink is a rather surprising £25, making the Number 1 Lounge at £25 per visit with free snacks and drinks an attractive consideration. Gatwick has the largest duty free shop in Europe. If you are coming back to Gatwick, they offer a useful free ‘shop and store’ service, to save you taking the goods with you. In particular, Jo Malone is always cheaper than on the High Street. Somehow a bottle always ends up in my shopping basket. North Terminal is due for a facelift in early 2014 and a new Bloc hotel will join the excellent Premier Inn, heralding exciting times for Gatwick. There is a good case for a second runway at the airport. Having had Gatwick on my doorstep for the past eighteen years, I am now rather disappointed that I have recently moved away.